This Saturday’s New York Times contains a pretty strange report about a Manhattan psychic and a desperate sucker who gave her a ton of money. 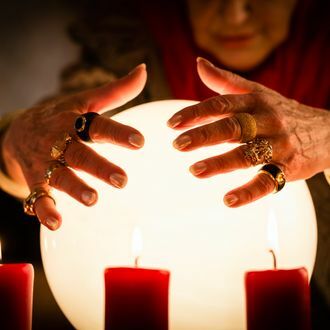 According to the newspaper, the unnamed 32-year-old Brooklyn man began visiting 26-year-old Priscilla Kelly Delmaro’s Times Square fortune-telling operation in the summer of 2013. You see, the guy was in love with a woman named Michelle who did not love him back. (“The girl didn’t want to be with me, and the girl had categorically made that clear,” he explained to investigators.) Longish story short, Delmaro convinced him that she could get Michelle to reciprocate his feelings, and he ended up forking over a total of $713,975 for her services, including $56,000 to eliminate a “stalking” spirit, $40,000 for “a fake funeral ritual to make the spirit think the man was dead,” $80,000 for “a bridge of gold in the other realm,” and $30,000 for a “time machine” made out of a Rolex watch. It seems that the man finally lost faith in Delmaro after she spent a year trying and failing to reincarnate Michelle, who died in February 2014. So he took his case to the NYPD, whose officers arrested the psychic and her “companion,” 27-year-old Bobby Evans, in late May. The Times reports that the pair remains in jail on charges of grand larceny, even though Delmaro’s client appears to have willingly (if somewhat crazily) paid Delmaro to perform magic (the results of which are notoriously difficult to measure). Either there’s more to the story, or New York City law enforcement is way more gullible than we thought.